Pantry pests are also called “food pests” or “stored-product pests”. 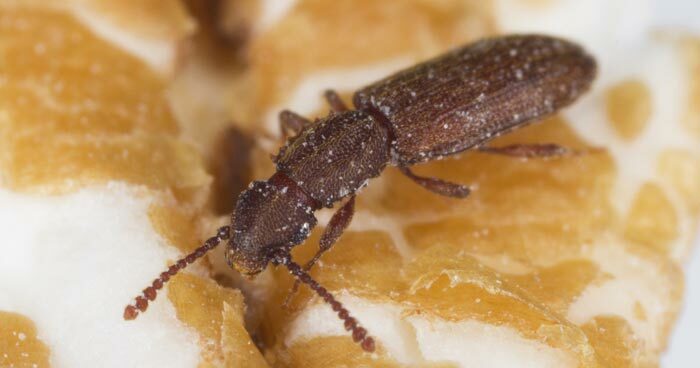 These pests attack food items that are stored in homes, warehouses, on store shelves, or wherever food items are held, especially for long periods of time. Items commonly infested with these pests in the homes are products such as bird and dry pet food, flour, corn meal, pasta products, dried fruits, nuts, grains, spices, cake mixes, and cereals. If you need help figuring out what type of pest you have and the best treatment for your situation, just contact a professional at Midwest Exterminating. Cigarette Beetle – Lasioderma serricorne (Fabricius). The cigarette beetle as the name implies is probably the most important pest of stored tobacco. It may also be found in food items such as rice, ginger, spices, dried plants and many other stored food items. Adult beetles are light brown, about one-eighth inch long and readily fly. The head is folded in a downward facing position. Getting rid of all infested food items is critical to control. Rice Weevil – Sitophilus oryzae (Linnaeus). 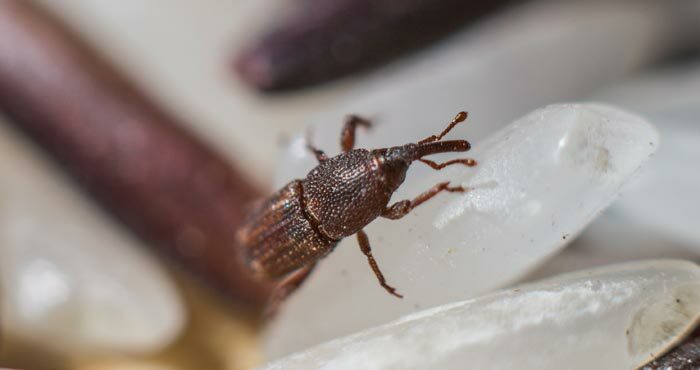 This weevil is reddish brown in color with four light red or yellow spots on the back. It is widely distributed due to grain and food distribution. It will infest grain both in the field and in a storage environment. The female chews a small hole in the whole grain, lays a single egg per grain, then seals the hole. The resulting larva feeds on the inside of the grain before emerging as an adult beetle by chewing an exit hole in the grain. By the time the exit holes are beginning to be noticed in the grains, infestation of the product may be significant rendering the grain unfit for food. Getting rid of all infested food items is critical to control. Indianmeal Moth – Plodia interpunctella (Hubner). The Indianmeal moth is the most common moth found infesting food items in the home. It is able to feed on a wide variety of items such as cereal, dog and cat food, potpourri, corn meal, chocolate, dried fruit, etc. Mistaken for clothes moths frequently, this moth has a copper color to the last half of the wings where clothes moths do not. It is typically found resting on walls with the tips of the wings touching the surface of the wall and the head being held off the surface. Infested food items will have a web-like material on the surface of the food which is spun by the larvae. When ready to pupate into the adult moth, these larvae leave the food item, crawl upwards toward an area with light, spin a cocoon which is typically found at the wall and ceiling junction. Getting rid of all infested food items is critical to control. Saw-toothed Grain Beetle – Oryzaephilus surinamensis (Linnaeus). This beetle is found in such foods as pasta, breakfast cereal, flour, dried fruits, dried meats, chocolates, and other similar food material. They are one-eighth inch long making them small enough to get into boxes and packages that are unopened. Food items already infested are usually bought and brought home without the knowledge of the infestation. The longer the infested items sits unused, the more the infestation will grow with the possibility of other food items becoming infested. Getting rid of all infested food items is critical to control.